Kaneto Shindo's "Post Card" practically vibrates with robust theatricality and unexpected humor. Though it takes place in what appears to be a completely realistic setting, the performances—particularly Shinobu Otake's tormented Tomoko—are by turn sincere and studied, then passionate and over the top. The variance in tone and purposeful artificiality give the film a weird off-kilter quality not unlike more accessible work by David Lynch, but without the idiosyncratic weirdness (imagine Sidney Lumet filming "Mulholland Drive"). It's unlike anything else I've seen, and while it's not an especially pleasant or traditionally satisfying film, it's well worth seeking out. Please note that the following contains spoilers. Set in the latter half of World War Two, "Post Card" follows the tribulations of a woman and the family she married into. Tomoko and her husband Jouzukuri (a gentle Naomasa Musaka) are in love. They're borderline destitute, farming a small parcel of land they do not own and sharing a two-room house with his elderly parents. They sleep in the barn for privacy, in a two tatami mat area walled off from the straw and tools. When he is drafted into the military, it is treated as an honor by the town proper but is a horror to her and an immediate hardship to the household. Now part of a unit and awaiting their deployment, Jouzu and friend Keita (Etsushi Toyokawa) sit down for a serious talk. Jouzu's assignment is almost certainly a death sentence, and he wants Keita to take a postcard Tomoko has written to him and, after the war, tell her that he received it and that it was meaningful to him. He can't respond to her himself, he explains, because anything he writes would at best be heavily censored by the military. Keita reluctantly agrees. After Jouzu's death, his parents ask Tomoko to stay on in the home and care for them, and could she also marry their younger son so it's not improper? Though heartbroken she agrees, making the best of it. Subsequently the brother is drafted and killed leaving her a war widow twice over, an emotionally drained husk. When Keita finally travels to Tomoko's village years later to deliver the message, they've both been through almost surreal hardships. These two broken people sit and share their stories, shown in flashback, and it's here that Otake's Tomoko has a passionate series of scenes. She wails, eyes bulging from her head, raging against the situation she's in—a situation dictated by traditional societal roles, giving her no options, and sitting across from a man who by sheer luck avoided the fate shared by both her husbands. Toyokawa doesn't try to match her passion but rather plays a quietly bitter variant of his usual stoic. Ren Osugi, no stranger to broad performances, plays a local man who wants Tomoko for his mistress and recognizes that Keita is a threat to that plan. Among many other important sequences, their eventual conflict is played mostly for laughs and relieves some of the tension built up through Tomoko's monologues. It's difficult to say how "Post Card" became Japan's entry for the Best Foreign Language Film category at this year's Academy Awards. 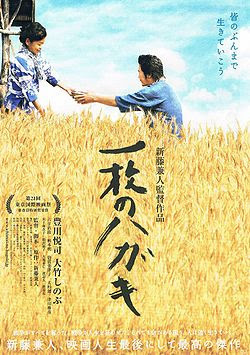 Certainly the film has none of the warmth or broad appeal of 2009 winner "Departures", but it is an artful if idiosyncratic work about serious subjects. Credit the cast for buying into Shindo's vision and committing highly stylized performances to film. Otake is raw and primal; her demeanor switches from the flat, resolute filial duty of one defeated by fate to a manic fury over the hand she's been dealt. It's an operatic performance unfettered by restraint. But perhaps her voice had to be big, meant not to be that of a single widow expressing grief and frustration but rather the cry of a nation against a culture of senseless sacrifice. So, then, the other characters become representational: Toyokawa is the aimless everyman unsure of where he belongs in a post-WW2 society, Osugi the hardliner who can't let go of the rigid structure of the past, and so on. The cast is too old; at 50, Toyokawa is the youngest primary player. Though men well into their 40s were being called into service, particularly toward the end of a war that began far easier than it ended, the parts in "Post Card" seem to be written for people with much more life in front of them. A flashback scene in which Tomoko and Jouzu discuss their plans to have children after the war should be touching but elicits disbelief. Shinobu Otake is feisty and girlish and the cast is game, but credulity is stretched a bit too far. "Post Card" will not be your favorite Japanese film of 2011. In fact you may not enjoy it at all, but I'd recommend it; I would argue that it's an interesting and necessary film unfettered by commercial or critical influences. The basic story of these characters would inspire a very commercial love story. While those elements are present, they aren't exploited or even acknowledged in the traditional sense. There is scarcely more passion to Tomoko and Toyukawa's budding relationship than in her second marriage to her younger brother-in-law, and it's difficult to imagine the ending as either romantic or happy though it satisfies the basic tenets of each. Perhaps this ending is Shindo's cry of rage, bemoaning the path not taken by Japan. 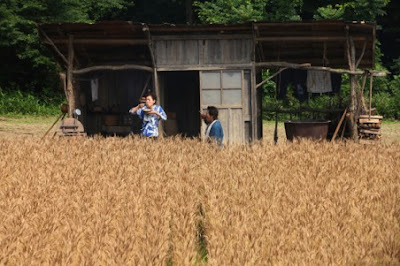 Opting out of society by living in a barn and toiling in your small patch of farmland is one response to the horror and sacrifice of war, but it's not exactly a solution to the impasse facing Japanese society in 1945. It's not even a suitable solution to Tomoko's specific problems. It might be Shindo's acknowledgement that such problems aren't solvable, a strangely hollow "ganbatte" making that point. Whether it's uplifting or utterly defeatist is up to the viewer. Additional note: the subtitles are blatantly and (presumably) purposefully wrong in one significant way: though now her husband by marriage, Jouzu's younger brother Sanpei continues to address Tomoko as "Onaesan" (older sister) even as he makes love to her. This awkward formality adds a touch of humor to their relationship and further indicts the Japanese culture of the time. However, the English subtitle with every "Onaesan" was "darling"—neither literally nor figuratively correct. This choice robs these scenes of a degree of absurdity that Shindo, also the screenwriter, specifically intended. It's an unfortunate decision on the part of the studio. "Post Card" was presented as part of the 35th Portland International Film Festival, one of over 100 films representing dozens of countries from around the world. For more information about the NW Film Center and PIFF, visit http://www.nwfilm.org/.